Sometimes it is fun to put together a boat that takes little time to build and has a wealth of uses. 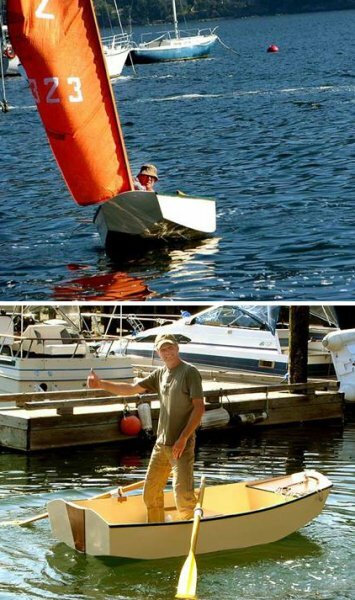 Last winter at the Cowichan Bay Maritime Centre and Wooden Boat Society in Cowichan Bay we downloaded from the internet a set of plans for a small dinghy that is stitch and glue. The design is known as a Devlin 4... years ago I built one using the wire stitch and glue method...this one we used Zap straps...those wonderful one way plastic ties. Once the epoxy/fiberglass has kicked off on the inside a cold chisel finishes the outside flush for the outer epoxy/fiberglass tape. I kept track of the build time...19 hours... it took longer for the paint to dry than build the boat. One of our Cowichan Bay Maritime Members came by and asked if I was building a Sabot... he had some Sabot plans. After close inspection the Sabot was very close to this build. Hence a center board and rudder was built and a donated sail turned the project into a neat little sailboat.